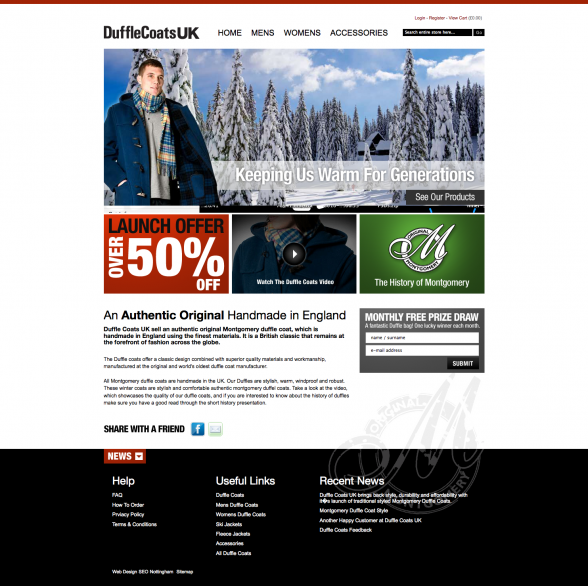 We created the brand, search engine strategy, website design and ecommerce platform for Duffle Coats UK and have delivered our goals. The site is now number one for the searches ‘duffle coats‘, ‘mens duffle coats‘, ‘duffle coats for women‘ and several more. Our ambition with the site now looks beyond the original objectives as we tune and target the site targetting greater traffic streams further afield in more challenging areas. The traffic generation and conversion techniques built into every fibre of the site will ensure the client continues to yield good revenue from the site for a long time to come.